Delegates looking to attend this year's Global Berry Congress (GBC) in Rotterdam have just one week left to take advantage of the special Early Bird offer, which offers a saving of 15 per cent on delegate tickets. Global Berry Congress, which takes place on 19-21 March, is a world-class event that brings together berry professionals to share ideas about where the international soft fruit business is heading. Join the best and brightest from all corners of the international berry trade to meet, learn and network. 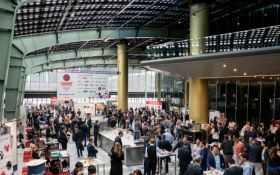 Global Berry Congress 2018 promises more content and a bigger exhibition than ever before. Global Berry Congress 2018 will continue to offer unrivalled information and insight about key topics affecting the international berry business. This year, a revamped and expanded format will offer a platform to more than 40 industry experts, who will contribute to the event’s largest-ever programme of talks, discussions, interviews and workshops. All of the sessions will take place in the GBC Expo area, bringing speakers, delegates and exhibitors closer together than ever before, and for the duration of the entire show. Keep an eye on GBC programme for the latest updates on topics and speakers, or visit the Fruitnet Media International stand at Fruit Logistica in Hall B/CityCube A-04 for more information.